One of my favorite breakfast recipes is avocado toast with egg, however when eating low carb and Keto that is not a breakfast that fits on plan. It was a must do for me to come up with a Keto Avocado Toast Recipe so that I could enjoy a breakfast that I love. 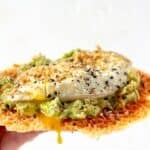 There is just something totally amazing about the oozing fried egg, mixed with creamy avocado with the crunch of the cheese toast combined that gives the most amazing flavor with this Keto Avocado Toast Recipe. (Ps I am making myself really hungry just thinking about this Keto Avocado Toast Recipe!). This is the perfect breakfast to add to your Keto Diet Meal Plan! I do not always eat breakfast, however when I do I like to change things up. As much as I like bacon and eggs, I need some variety in my keto breakfast. Things like Avocado & Egg nests, and Egg breakfasts cups are my normal go to keto breakfast items but once I made this all things changed! Plus it goes well with my keto coffee! You could make this Keto Avocado Toast Recipe using 90 second keto bread, however I don’t find that to be the best way to enjoy Avocado Toast. The best way to enjoy Avocado Toast is to have it on a large cheese chip! 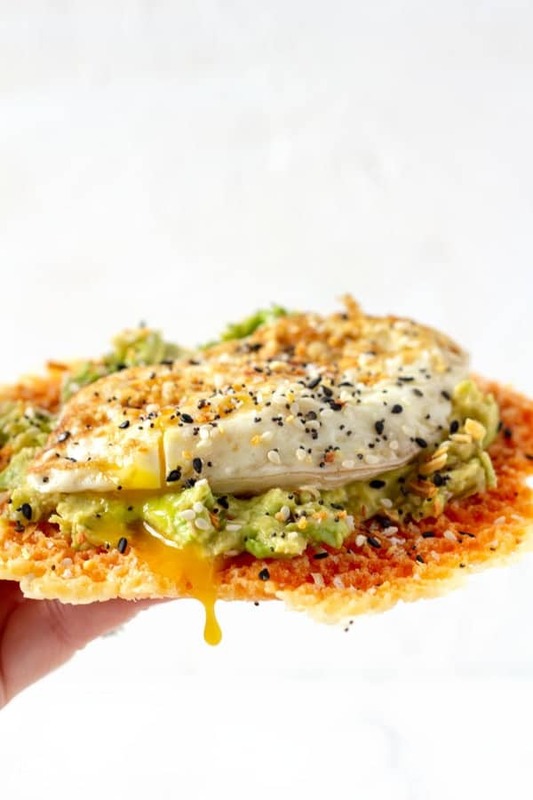 If you are wanting to have a bit of a kick to your avocado toast, then you could also make a Jalapeno Cheese Crisp instead. 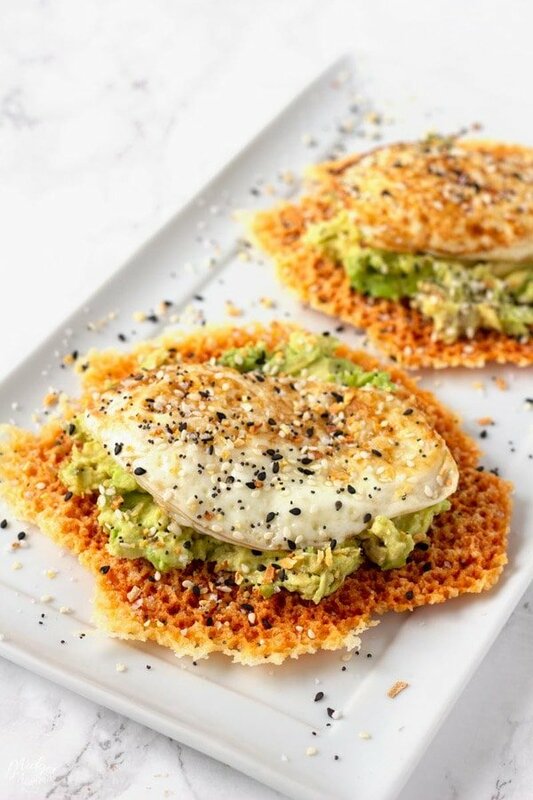 When you are making this keto breakfast recipe, you are going to want to use parchment paper on your plate when making the cheese chips. This is important for making sure your cheese chips do not stick when you are making them. If you have a jar of the Everything Bagel Seasoning, sprinkle a bit of it on top and that makes this amazing Avocado Toast Recipe even better! 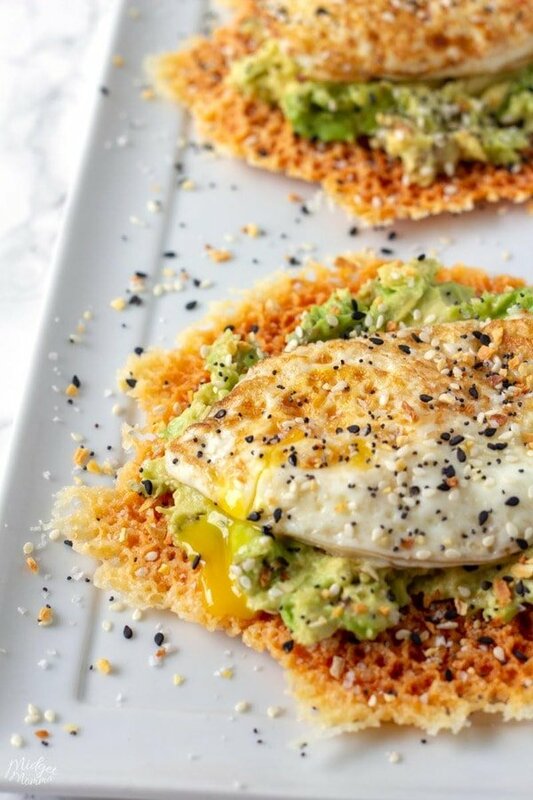 Keto Avocado Toast Recipe is made with a tasty fried egg, creamy avocado and crunchy cheese toast! Making this the perfect Keto Breakfast! Place a piece of parchment on a microwaveable plate. Sprinkle half a cup of the cheese onto the parchment paper. 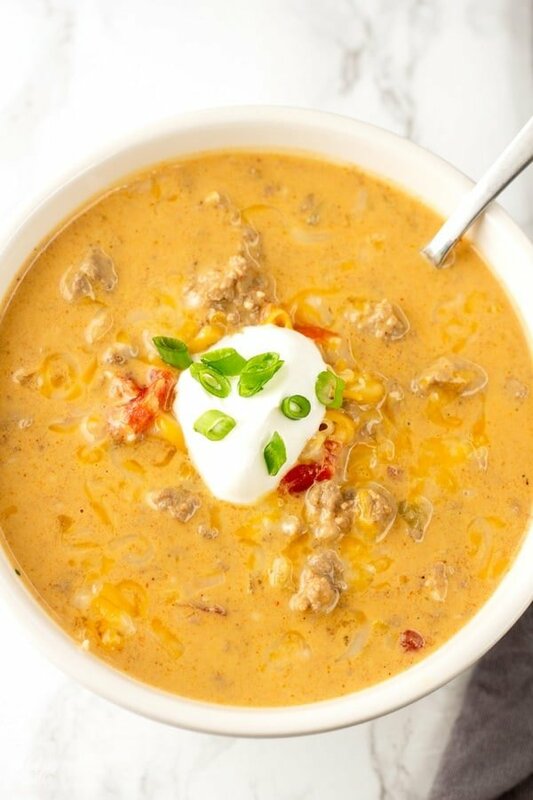 Microwave the cheese on high for 2 minutes. Once the cheese is cooled place that piece of cheese toast onto another plate and repeat these steps with the remainder of cheese to make your second piece of cheese toast. Cut the avocado in half and carefully remove the pit. Using a fork mash the flesh of the avocado until it has a chunky texture. Spread the avocado onto each cheese toast. Heat a medium saute pan over medium heat. Spray the pan down with the pan spray. Crack each egg into the pan and cook until it starts to set then flip the egg over and continue to cook until the egg has reached your desired doneness. You will want each egg to cook on their own vs combining into 1 egg. Season the eggs with your salt and pepper. Top the toast each with one egg and sprinkle Everything bagel seasoning on top. Reminder - to calculate the net carbs subtract the fiber from the carbs amount.